A difficult night ended in a first defeat of the season for the U21s. A very late goal from Spurs gave us no time to look for an equaliser in what was a flat performance. Changes in the boardroom where Christian Purslow joins to organise the club’s global commercial activities. This is the stuff that really gets pulses racing, er, or not. Purslow will be flying round the world signing sponsorship deals and looking for the next shirt sponsor. Samsung have hit financial woes and are unlikely to stump up for a new deal. You will remember Christian from the dog days of the Hicks and Gillett reign at Liverpool where he saved them from the Royal Bank of Scotland. A rusty performance against confident opposition but ultimately it was a positive night. Didier Drogba and Andreas Christensen both enjoyed it: Drogba because he scored one (to make it three in three) and pressured their defender into the own-goal winner; Christensen because he made his debut at right-back and looked comfortable enough. There isn’t much more to say, it was a wet old autumn night. The travelling fans were in good voice throughout. The home fans packed their ground for a record attendance and we can watch the draw tomorrow night. Derby County away in the next round of the league cup. Sky are keen to spice up any aspect pf the draw so tonight they drew cubes from the hat rather than the traditional balls. Can’t say that it made the process any more exciting. Still, perhaps it is just us. The draw was made after a vibrant Newcastle B-team disposed of Manchester City. Derby are riding high at the moment and came from two down to beat Fulham 5-2 yesterday. Pick of the ties has to be Bournemouth at home to Liverpool. A training ground friendly didn’t really go as planned but a lot of rust was shaken from a few joints as Dion Conroy and Kevin Wright came back after injuries. Izzy Brown opened the scoring at the end of the first-half with a composed finish but two late sucker punches took the bragging rights down the M4. A scraped win in possibly our most disjointed performance will have upset Manchester’s teams ahead of their derby. It puts a lot of pressure on that match as we strode to a nine-point lead over City and a 13-point cushion over Salford. QPR traditionally put up a tougher fight against us than they manage in the rest of their lacklustre season and so it was today. 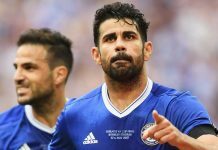 Diego Costa returned from four games out with injury and illness and looked a little rusty. Otherwise the side was as expected. Ramires was available and made a very late appearance from his own injury problems. We started with a flurry of corners as we probed another deep and obdurate defence. QPR came to play on the break and managed on header over the bar but little else. It looked a game that would require an act of genius and act of genius it got. Cesc Fábregas played in Oscar wide and his first-time, outside of the boot shot angled in off the far post was the most sumptuous strike since Gianfranco Zola. 1-0. Robert Green late commented that he applauds some as they go in and that Oscar had used both the outside of his boot and the wind direction to achieve the finish. Oscar was influential throughout and not just with his goal. Although we struggled for the usual rhythm we worked extremely hard to win the ball back and Oscar epitomised the work rate. We didn’t add to the strike before the break and QPR came out for the second-half a bit more adventurous. They sensed some reward and got it when a wayward shot was flicked in via a Charlie Austin backheel. 1-1. Eden Hazard then buried the match, it was his run that was terminated by a shoulder barge inside the box and his usual calm penalty restored the lead. 2-1. There were more chances but no more goals as we continued our good start to the season. Jose said later that the atmosphere inside the ground was flat. It seems a little harsh as we are all adjusting to colder weather and darker evenings. Honestly though, all home grounds are quiet these days and there is a very simple reason: money. We need cheap standing areas where groups of rowdy younger people can make themselves heard. The age profile of the average Chelsea fan who can afford a season ticket matches that of Londoner who can afford a mortgage. Tammy Abraham continued to impress with a backheel finish for his fifteenth goal of a prolific season. We came home without the points thanks to a first-half leveller and a second-half free-kick winner that enabled the Royals to sit behind the ball and defend with discipline. Previous articleCan you buy success in the Premier League?